Martine Bedin was born in Bordeaux in 1957 and grew up in Corsica. She studied architecture in Paris before receiving a scholarship to go to Florence in 1978, where she met the members of the Radical Architecture movement. These included the founders of Studio Alchimia, Superstudio and Archizoom Associati, who were focused on deconstructing classical architecture into new forms. Superstudio founder Adolfo Natalini invited her to Milan in 1979, when she was introduced to designers Michele De Lucchi and Ettore Sottsass. 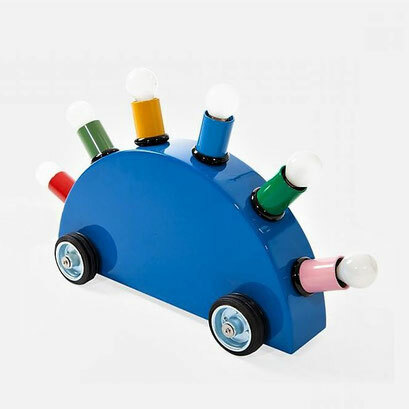 Sottsass took the young french designer under his wing while she was still a student and helped turn her whimsical wheeled designs into realised products. She spent three years during the early 1980s at Sottsass' studio, working on her own designs while writing for a French magazine to cover her living costs. It was during these years that Memphis group born and Bedin was one of the founders with Ettore. The Memphis Group intended to create a chaos in the co-ordination of style and has become closely associated with Postmodernism. Bedin realized mobile furniture and lighting designs for Memphis, creating its most iconic pieces. She works in diverse materials such as marble, wood, metal and ceramic. In addition, she has worked as an architect, industrial designer and professor. Her work is held in many important museum and private collections.